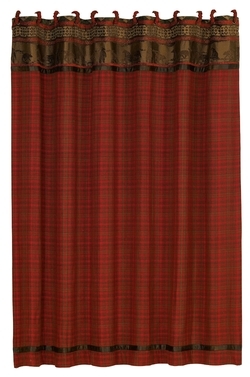 The ultimate outdoor expression, the Cascade Lodge Shower Curtain brings together a bear and pinecone fabric with cozy plaid in warm red, green, gold and brown tones. Measures 72"W x 72"L and includes 12 coordinating fabric-covered rings. ~ Ships from the manufacturer. Allow 1 week. Cannot express ship or ship to Alaska.